The Carbon Racing SUP Series 14 12.6 and 14.0 are made for speed – pure and simple. We have refined the shape of our winning design creating a sleeker, narrow and faster board! 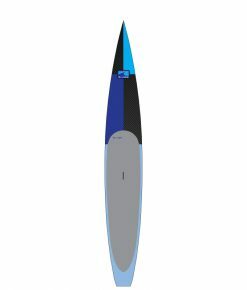 At 26.5” wide our new shape is stable enough for the experienced racer, and narrow enough to provide excellent glide and speed. Constructed with our single layer biaxial carbon construction with re-enforcement layers in impact and standing areas, the new Carbon Race will be an ultra-light speed machine. 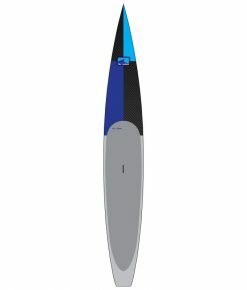 Shapers Notes: With distinct piercing V nose, the board cuts through the water like a knife and the slight concave bottom through back third of the board releases water effortlessly and promotes planing. Minimal rocker for increased water-line and speed. The Carbon Race 12.6 and 14.0 are made for speed – pure and simple. We have refined the shape of our winning design creating a sleeker, narrow and faster board! At 26.5” wide our new shape is stable enough for the experienced racer, and narrow enough to provide excellent glide and speed. Constructed with our single layer biaxial carbon construction with re-enforcement layers in impact and standing areas, the new Carbon Race will be an ultra-light speed machine.